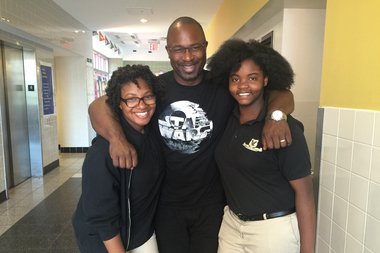 Principal Jamaal Bowman has entered a contest to create a new high school with the help of his students, including eighth-graders Leanne Nunes and Dana Neil (L-R). EASTCHESTER — The outspoken principal of a Bronx middle school has entered a $10 million contest he hopes will give him the chance to expand his work in education by creating a high school. Jamaal Bowman, principal of the Cornerstone Academy for Social Action Middle School and a critic of testing in New York, has entered XQ: The Super School Project, a contest that calls on people to submit ideas for new and innovative high schools. The winners will receive $10 million over the course of five years to turn their ideas into actual schools. "We always try to push the envelope of innovation, student-centered learning," Bowman said. "We just began to work more explicitly towards things that the project was asking for." The competition launched in September and received nearly 700 applications. Hundreds of schools have already been cut, and the winners — there will be at least five — will be announced in August. Bowman's ideas for CASA High School include using New York City as a classroom based on its museums, financial institutions and corporations, as well as a heavy focus on interdisciplinary work. "No longer should each discipline — math, science, humanities — be looked at in silos," he said. "We should take an interdisciplinary approach to curriculum because in the 21st Century economy, students have to be able to look at things holistically." Students would also spend one day a week outside of school working at an internship and spend their senior years studying outside of New York state. "Senior year is usually a winnowing down year anyway, so why not create true global citizens by taking them outside of New York state, outside of the United States?" Bowman asked. "Go learn with cultures all over the world." Bowman stressed that he did not come up with the ideas for CASA High School on his own. Students at CASA Middle School contributed their thoughts, including eighth-grader Leanne Nunes, who advocated for more classes focused on teaching practical skills such as managing personal finances and staying in shape both physically and mentally. "I opted for more technology classes and more classes that taught you about real life and prepared you for life after school," Leanne said. "More home economics, more classes focused on ethics, classes where you could have a real discussion. It wouldn’t just be a lecture." Eighth-grader Dana Neil said she pushed for giving students more of a say over what they learn, as she felt that the more input students have over what goes on in their school, the more they will like going there. "Allowing a kid to help build a high school is really important because you know that kid will enjoy school every day for as long as they go to that school," Dana said. CASA Middle School ranked No. 1 last year in the city for improved test score average on state English and math exams, but Bowman has since become a staunch defender of letting parents opt out of the tests, talking at schools across New York about why it is important to expand education beyond test prep. Bowman said he would try to make his new high school a consortium school, meaning it would give performance-based assessment tests instead of Regents exams except for English, and limit the amount of testing that takes place within its curriculum. "We will apply to try to be a consortium school," he said. "If that doesn’t happen, we’ll work with what we have." Although there are still several schools left in the competition, Leanne said she is confident about CASA's chance for a victory. "I feel pretty good about it, I’m not going to lie," she said. "I think what we’ve planned and what we’ve come together on could be an actual school."